You want the most important ideas on management all in one place. 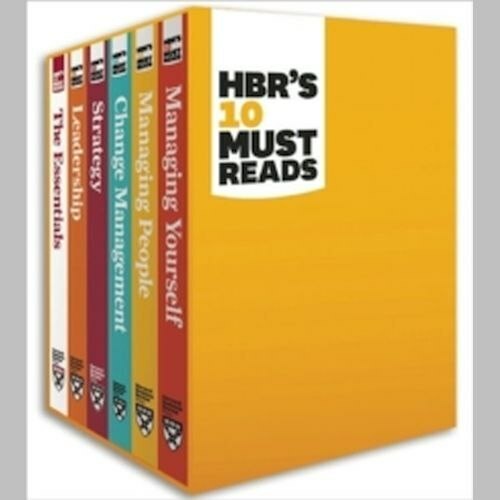 Now you can have themï¿½ in a set of HBR's 10 Must Reads. We've combed through hundreds of Harvard Business Review articles on strategy, change leadership, managing people, and managing yourself and selected the most important ones to help you maximize your performance.This six-title collection includes only the most critical articles from the world's top management experts, curated from Harvard Business Review's rich archives. We've done the work of selecting them so you won't have to. These books are packed with enduring advice from the best minds in business such as: Michael Porter, Clayton Christensen, Peter Drucker, John Kotter, Daniel Goleman, Jim Collins, Ted Levitt, Gary Hamel, W. Chan Kim, Renee Mauborgne and much more.The HBR's 10 Must Reads Boxed Set includes:HBR's 10 Must Reads: The EssentialsThis book brings together the best thinking from management's most influential experts. Once you've read these definitive articles, you can delve into each core topic the series explores: managing yourself, managing people, leadership, strategy, and change management.HBR's 10 Must Reads on Managing YourselfThe path to your professional success starts with a critical look in the mirror. Here's how to stay engaged throughout your 50-year work life, tap into your deepest values, solicit candid feedback, replenish your physical and mental energy, and rebound from tough times. This book includes the bonus article "How Will You Measure Your Life?" by Clayton M.
Christensen.HBR's 10 Must Reads on Managing PeopleManaging your employees is fraught with challenges, even if you're a seasoned pro. Boost their performance by tailoring your management styles to their temperaments, motivating with responsibility rather than money, and fostering trust through solicited input. This book includes the bonus article "Leadership That Gets Results," by Daniel Goleman.HBR's 10 Must Reads on LeadershipAre you an extraordinary leaderï¿½ or just a good manager? Learn how to motivate others to excel, build your team's confidence, set direction, encourage smart risk-taking, credit others for your success, and draw strength from adversity. This book includes the bonus article "What Makes an Effective Executive," by Peter F. Drucker.HBR's 10 Must Reads on StrategyIs your company spending too much time on strategy development, with too little to show for it? Discover what it takes to distinguish your company from rivals, clarify what it will (and won't) do, create blue oceans of uncontested market space, and make your priorities explicit so employees can realize your vision. This book includes the bonus article "What Is Strategy?" by Michael E.
Porter.HBR's 10 Must Reads on Change ManagementMost companies' change initiatives failï¿½ but yours can beat the odds. Learn how to overcome addiction to the status quo, establish a sense of urgency, mobilize commitment and resources, silence naysayers, minimize the pain of change, and motivate change even when business is good. This book includes the bonus article "Leading Change," by John P.
Kotter.About the HBR's 10 Must Reads Series:HBR's 10 Must Reads series is the definitive collection of ideas and best practices for aspiring and experienced leaders alike. These books offer essential reading selected from the pages of Harvard Business Review on topics critical to the success of every manager. Each book is packed with advice and inspiration from the best minds in business.